Behaving as if the God in All Life Mattered - Perelandra Ltd. This best-selling autobiography describes how it all started for Machaelle. It's a story of trust and triumph. And it's a story that will forever change the way you live. Have a curious, nature-conscious friend? 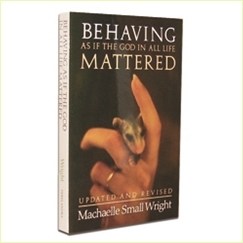 If you have a friend on your holiday list that may be interested in taking their understanding of nature and ecology to a whole new level, Behaving is a superb gift. It's available over the next few weeks for $5 off the regular price, and you can request to have the book signed by Machaelle and gift wrapped for free! "I just finished reading Behaving for the second time and am reading Dancing again. I am astonished at how much more I continue to get from them. The books have had such an enlightening and exciting impact on my life." "This is an amazing book, I plan on reading again. There is so much content, I'm sure I didn't absorb it all, and so many things that open one's eyes and expand the thoughts." "Started reading yesterday, could not put it down. That hasn’t happened in a while. Reading about her childhood was fascinating. Though she had a difficult one, her positive, survivor attitude kept her going. … Thanks to her writing about her garden, I am so looking forward to trying some new things in mine this spring. I will end up passing this great read on to all my friends." "Five stars. If you have never read this, you are missing an important milestone in your personal development." Behaving is also available in Spanish and French. It's an electronic version of the book that you can purchase, download and begin reading right away on your computer or PDF-friendly reader. Besides the immediate gratification, the e-book offers interactive features, it's environmentally friendly, and it saves you money! Start by purchasing the book, just as if it were any other product on our site. You'll be able to download the book after you've completed your order. If you get stuck at all, come back and click here for help. Click here to find out if your computer or device and software is compatible with our e-books. Behaving turned my life upside down and added a whole new dimension and level of excitement to it. I was particularly struck by Machaelle's persistence and creative ways of dealing with the knocks she experienced throughout her childhood and teen years. Never taking no, but turning things to her advantage. Smart. Strength of character. Downright funny. And human. Not to be missed: the Cosmic Chess Exercise at the end of the book. It works! I took EVERYthing out of one room and, working with the deva of that room, figured out what went back and where. The grand finale was a huge surprise. . . energetically, the room and I were a perfect match. My emotions soared just being in it. Lots more room to breathe and I felt like I could tackle anything in my life that came along. Thank you, nature, and thank you, Machaelle, for leading the way. Jeannette & Beth thank you for your recent email encouraging us to read or reread Behaving. This book was also my first experience with Perelandra. It was the book picked for a discussion group I was in more than 15 years ago. Of all the books I have read, parts of this book are forever in my memory and have continually inspired me over the years - Machaelle alone in Virgina Beach as a teen living in an abandoned motel and surviving, her beginning experience with meditation (on the bridge making packages of her thoughts), turning her garden over with a spoon. This book is beautiful and empowering. It was the first step. Then I got the essences, the Garden Workbook, the MAP book and so on … all of which have changed my life in the most positive ways.